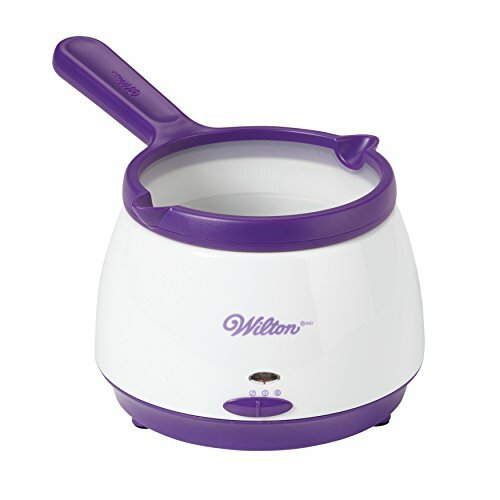 Make chocolate covered strawberries, chocolate covered pretzels, cake pops and more with the Wilton Candy Melting Pot. It features an easy-to-clean and convenient removable silicone pot with an ergonomic, heat-resistant handle and two easy-pour spouts — perfect for pouring melted candy into a decorating bag or drizzling directly onto treats. Once finished, simply chill the silicone pot until the candy hardens, then gently squeeze the soft silicone insert to pop out the remaining candy. The pot has two temperature settings, warm and melt so you can quickly melt up to 2 ½ cups of Candy Melts candy or chocolate in less than 10 minutes and keep it warm for dipping. An innovative heating base stays cool to the touch, a safety light indicates when the pot is on and it has rubber feet to keep it steady and in place on your counter. Powered by a standard 120-volt cord with polarized plug. Complete instructions included.